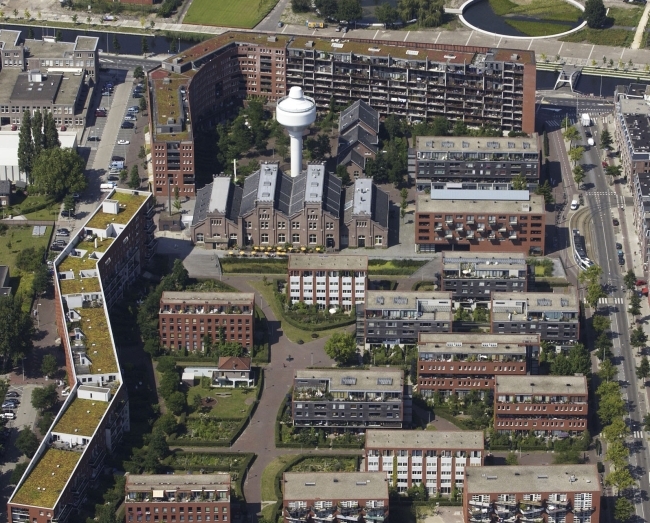 The Westerpark municipal district council decided to develop the former minicipal waterboard terrain (GWL terrain) in Amsterdam into a residential area in 1989. The complex was to be a car-free, environmentally friendly residential area. The plans not only influenced car use but also car ownership – the only parking spaces available were created on the edge of the complex. The complex includes properties for both renting and buying, with the emphasis on larger houses for families. There are generous outdoor spaces, apartments with roof gardens, private gardens for the ground floor properties and a green public space intended not only for the residents, but also for those living in the densely built adjacent neighbourhoods. Flyer in Dutch, English and German. Introduction to the GWL terrain and it’s ecological design. GREENPRINT: Examples of sustainable practice in the urban environment is a book of over 150 pages about sustainable practices all over the world. The book focuses on many subjects. One of these are sustainable neighbourhoods. In that chapter one of the projects is the GWL-terrain. Jan Scheurer, Murdoch University, Perth Western Australia, april 2001. Send us an email. We will be happy to arrange a tour for you based on your personal interests.